Sometimes when I look back at a bad weekend for the “in” column, I find I could have been a bit more liberal with one race and conservative with another, that my odds line was not so accurate and there were some miscalculations. But at the end of a weekend like the one I am now reviewing, I see nothing necessarily wrong with the approach to the horses that turned out losers and for a simple reason: They were beaten by favorites, dead-on choices that were obvious and attracted the majority of people whose main objective is to cash a ticket (the notion of profit comes in second, always). At the Meadowlands and Woodbine over the past few weeks, few strong public choices have tanked. The winter form of the trotters and pacers at these two mainline ovals in North America has been pristine; almost frightening in its accuracy. These are never good times for those of us in the upset business, so to speak. We don’t thrive on many winners but we make up for it with a few that topple the investment amount and award us with significant percentages—profits. On Friday night at the Meadowlands we had only two seconds in the Cape & Cutter divisions. Our choices in the Exit 16W raced miserably against the prohibitive choices. On Saturday night, we were fourth in the first Aquarius split and sixth in the second. In Canada Saturday, we were fourth in the first chapter of the WEGZ and in the second our horse broke stride when bothered and ran most the way, finishing ninth. Two horses we hawked last week during our Twitter session came back to win on the Woodbine program Feb. 4. Audreys Dream ($3.40) won with Musselsfrmbrussels second for a mild $16.80 exactor, and Grin For Money repeated a victory, paying $5.60. From the Watch List (H2W) at Pompano, Yankees In Six was our biggest winner of the week at $12.80. At Buffalo, the H2W had one winner, Allamerican Improv, fooling no one at $3.80. At Cal Expo, the no-takeout Pick 4, we grabbed two out of four in the $669-paying exotic. There were no favorites attached to the winning combo but two of the leg winners were second choices. The other two were smaller double-digit payers. 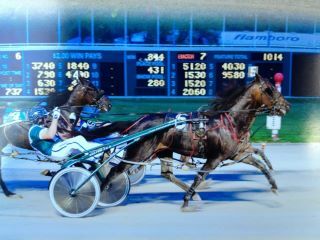 Our choice in the first leg, Hanover DGN, won and paid $10.20. We were looking good in leg two but Dreaming Of Amy, well supported at 5-1, never made if off the gate, breaking enough to eliminate all chances of getting into the action. We were second with Devilish Donnie (4-1) and then we won with Desired Result, who paid $7.20. Remember that we offer contenders in these races, which amounts to a small ticket. It is your choice to use any or all of our suggestions and add more to your ticket. 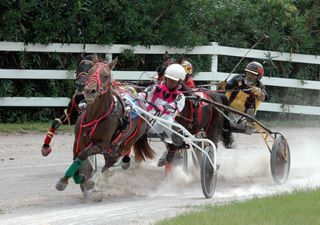 The Kindergarten Classic series for two-year-old trotters has seen nominations and purses increase each year. In 2011, the colt final went for $200,500 and the fillies fought for $182,500. For 2012, the Kindergarten expands from four to five legs and returns to the Meadowlands for the first two. The series’ legs begin on July 26 and come right back the next week at The Big M. The series resumes at The Red Mile for legs three and four on consecutive Sept. 13 and 20th. Skipping forward to avoid conflict with The Red Mile Grand Circuit, the last leg will be on Oct. 19 and the $175,000 (est.) on Oct. 26, both at Vernon Downs. A minimum of two leg starts is required to be eligible for the finals. Racing gets underway for the 47th season at Pocono Downs on April 3. Pocono will race Tuesday, Wednesday, Friday and Saturday from April-June and in July and August, Sunday evening racing will be added. All post times are 6:30 p.m., with the exception of Kentucky Derby day, which will feature an 11 a.m. card and another card immediately following the “Derby.” The first qualifying races will be held on March 27. One of the changes to the 2012 racing calendar is the move of the Ben Franklin Stake to Pocono. The $500,000 free-for-all pace was created at Chester by former racing secretary Rick Kane, who in 2010 moved to Pocono. The signature event now is set for June 30.